PRESS THE BUTTON FOR FREE PARKING! Yes, we know we need parking meters around the Square. Without meters, all the parking spaces would be taken all day by Rapid Transit riders and store employees. For a long time folks have asked for free short-term parking at the Square. I remember it being requested at the open meeting called by SHAD in February 2004. For months this page asked for them. We know of other shopping areas, including the part of Larchmere Road that is in Shaker Heights and Coventry Village in Cleveland Heights, that offer free short-term parking. Then it happened! 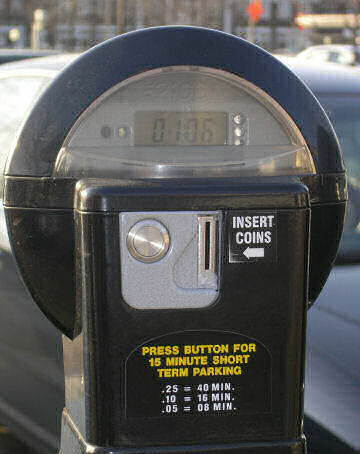 Some time early in 2007, with no fanfare or announcement, more than 60 parking meters all around the Square were changed. Now the meters have a new small button which, when pressed, will give 15 minutes of free parking. The improvement happened so quietly that though I park at the Square often, I kept feeding those %#! * meters. Fifteen minutes isn't a lot of time. But it is enough time to drop off your dry cleaning or get a cup of coffee in the morning, to use one of the many ATMs around the Square, or to pick up a take-out order on the way home. It's not just about saving a dime. It's a courtesy — a small gesture that says welcome to the shopper.